Have you even been out with friends who keep talking about this really great vacation they recently went on but you didn’t go and so you’re kind of left out and don’t know all of the inside jokes? I think that’s how most people in the Humanities feel when they hear the word Omeka, but don’t really know what it is. Omeka, as their website so eloquently puts it, is a “web publishing platform for sharing digital collections and creating media-rich online exhibitions.” Or in grad student terms, Omeka is a nifty online platform that allows you to create digital exhibitions. It can be really simple or more crafty depending on what you’re looking to create and how much effort you want to put in. While several new open source online exhibition platforms have become available over the last few years, Omeka is kind of the OG. Now I have a confession to make. I am not totally new to Omeka. We actually first met back during my first year of grad school for my Intro to Public History course. But, I am not an expert by any means (as I will soon show) and I was excited for the opportunity to reunite with Omeka and rekindle my relationship with it. Omeka actually has what I would consider a pretty spectacular user guide, and since I’m not one to reinvent the wheel, I’m going to draw on it to show you the most basic elements of how to get started (you can view the whole guide and more here.) Then, I’ll show you what a basic Omeka site looks like by giving you a glimpse of the site I made in 2016 (shameless self promotion, yes I know). Finally, I’ll show you some fantastic Omeka powered sites that put mine to shame, and show you what this platform can really do. So first things first. Go to www.omeka.net and click on Sign Up. Choose the Trial plan. Fill in the sign-up form. Check your email for the link to activate your account. Once you’ve activated your account, you’ll be taken to a page where you can create your own site. Fill in the information about your site’s URL, the title you want to use, and a description if you’d like, and Congratulations friends, you have a site! Which is why you’ll want to change the theme by clicking on the Appearance button and choose something more eye catching. Once you have your new and exciting theme, you are ready to add some content. You’ll find the item button on the left hand panel. Once you’ve clicked that, you’ll provide some information about your item. Just don’t forget to check the little public button on the right side of the page or no one will be able to see your cool stuff. You can also attach images to your items and link to URLs. Once you’ve added a bunch of items per the directions above, you’re ready to create collections. So for example, if your site is about the Civil War, you might have a collection on Civil War military uniforms, another on photographs, and a third on manuscripts. You can organize the items you want to put in each collection by following this simple process. Add a collection by clicking on the button to the left. Gives us some info on it. And add your pre-added items to it. Hooray! 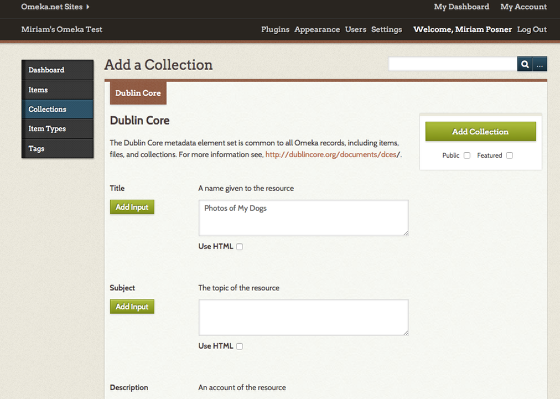 You now have a collection and are on your way to an awesome Omeka site! Now if you really want to get inspired by Omeka, check out its directory of sites found here. 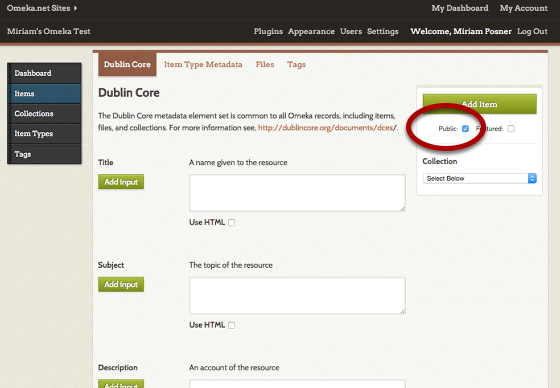 They utilize the plugin features that can be added to Omeka which you can learn about by following this link. 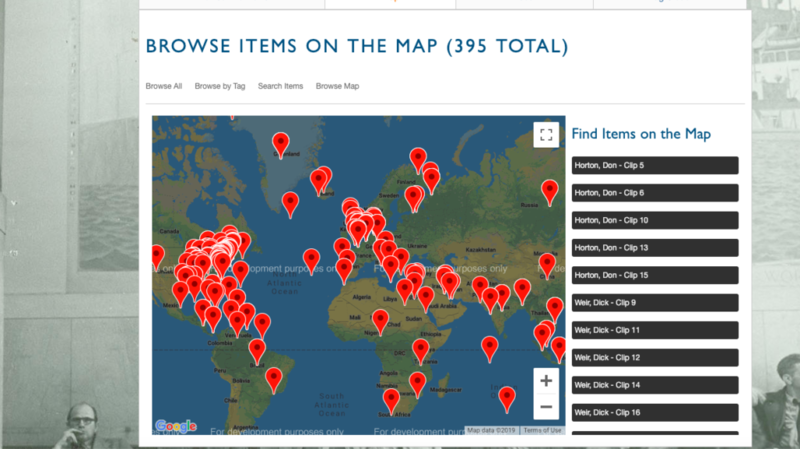 I really liked this site for the American Merchant Marine Veterans Oral History Project that features a really fancy interactive map. But my personal favorite site, that I was just ecstatic to find, was this one on World War One curated by the National Library of Serbia. 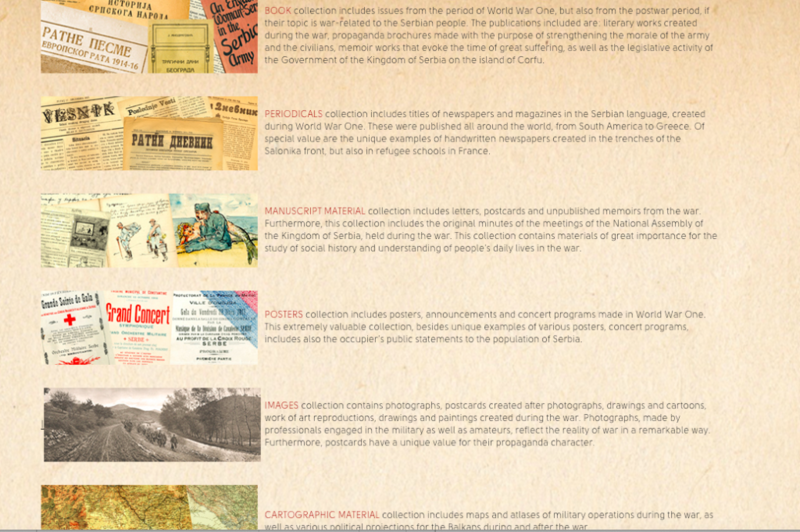 It features some great tools for educators teaching about the Great War and an awesome variety of collections. So now that you know how to use Omeka and have seen what it can do, the only question is what kind of digital exhibit you’ll curate.? As someone who relates to your “missed vacation” analogy, I am eternally grateful for the your easily comprehensible and entertaining guide to Omeka. Although I am wondering how it works in terms of copyright—since it’s an archives/exhibition website. 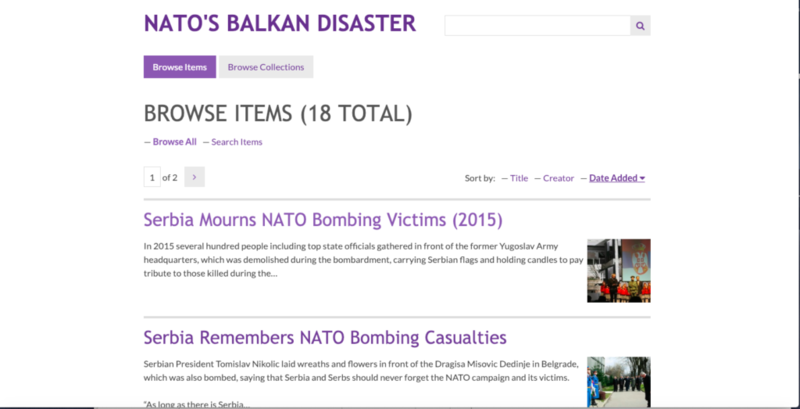 For example, on your own “NATO’s Balkan Disaster” site, you have a photograph of two Serbian boys and a bomb. 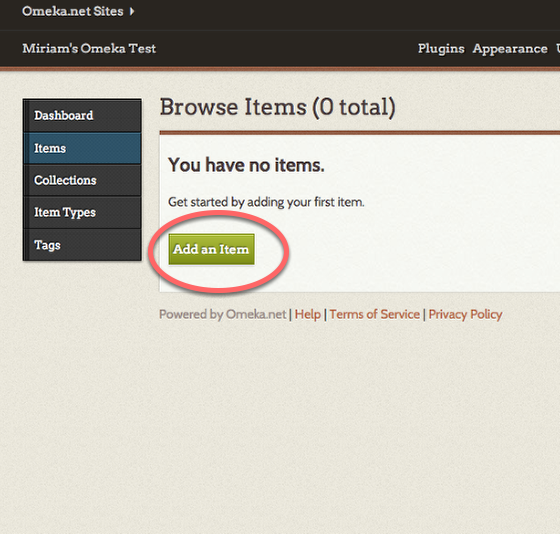 Do you have ownership over that item, or does Omeka allow you to borrow with accreditation? Hi Haley! You make such a good point. I personally dont know a lot about copyright. I’m not sure I did it for that image, but Omeka does have a place where you can add the original source where you found images or articles to give them credit. Such a useful post! I also can relate to your “missed vacation” analogy. 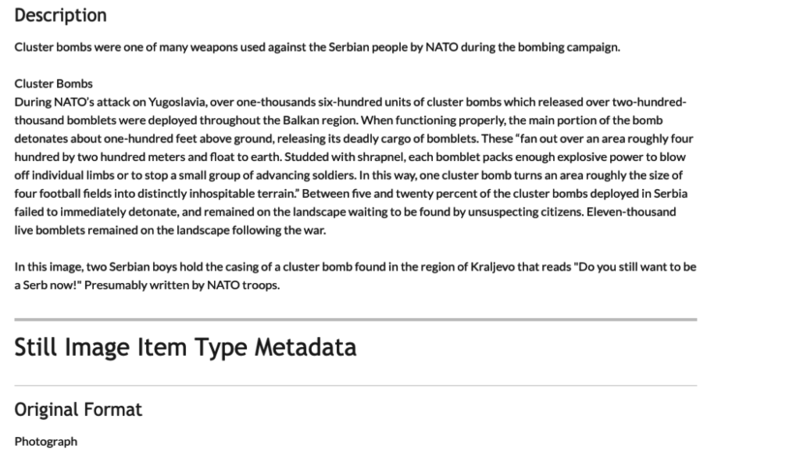 I had never encountered Omeka before reading the HIST 677 syllabus…. not even through the grape vine. And as someone who takes interest in the operational aspects of cultural institutions, I can see Omeka’s easy-to-use interface and low/no cost making it easier for institutions with low or waning operating budgets to continue making history accessible. I’m curious… what is Omeka’s most common type of user? Historical societies, local archives, and small museums, or larger institutions? I ask because so many institutions use software that isn’t Omeka. Other than financial and staffing considerations, I wonder what the main pull towards Omeka is for its users.